A few kilometres north of Agadir lies the atmospheric fishing village and surfers’ hideaway of Taghazout. This coastline boasts some of Morocco’s best surf spots, such as Killer Point, Anchor Point, Banana Point, Hash Point, Boilers or Mysteries. Reefs with very long right handers and excellent beach breaks for all levels, from total beginners to experts. Furthermore, as this stretch of coast is sheltered by Cap Ghir and surrounding hills, sunshine is virtually guaranteed in the region, with over 300 days of sunshine per year! 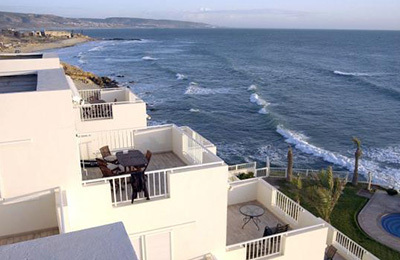 At the heart of this surfing Mecca, the stunning Killer Point Surf Resort is located right on the beach in front of Morocco’s most famous and exciting surf breaks, Killer Point. 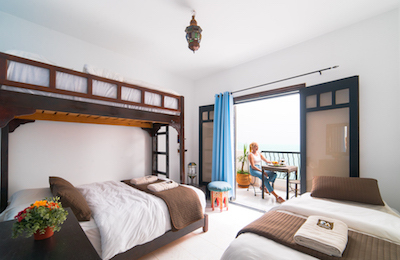 Experience Morocco’s world class surf in comfort and tranquility in these very tasteful, individually decorated exclusive apartments. Killer Point’s team will take care of everything for you; from airport transfers, to navigating the local Souks, quality surf guidance and coaching in the water, in order to make your stay fun and exciting in complete luxury and safety. Just outside the surfing Mecca of Taghazout, Killer Point Surf Resort is literally based on the rocks directly above the ocean. Awake from your slumber to the serenity of perfect waves peeling in towards you so close you could almost touch them. Location, location, location! Make sure you bring your camera! This is the most spectacular retreat that this region has to offer. Highly qualified surf instructors, and lifeguards to guide you in the water, and develop your skills.You can paddle out from the apartments to La Source, Mystery, Anchor Point and Killer Point. Brand new, very classy and elegant 2 and 3 bedroom apartments situated directly on the rocks above the ocean. Views to die for! Look from your bedroom across the infinity pool to the surf and horizon. Muscles sore from too many waves? Laze by the pool and soak up some sun and enjoy a fruit smoothie and massage! These apartments can be used in private or shared accommodation. Meals are served al fresco on the terrace next to pool or indoor when the weather gets cooler. To get you off to a good start in the morning, breakfast is a choice of tea or coffee, jaffles or sandwiches, fruit juice, toast bread and marmalade. Lunch are included in every surf package (see underneath) and composed of salad and tuna, chicken, ham or cheese sandwich. All meals incorporates authentic Moroccan cuisine and European dishes to suit every taste. We offer as well a menu for vegetarians. Every room is provided with a paper slip to be filled everyday where you can ask for the type of drink that you wish. One hour later it will be in your fridge. SURF SPOTS Killer Point is surrounded by classic Moroccan surf breaks. Directly in front to the right lies the legendary “Killer Point”, then moving toward the left is the perfect A-frame waves of ‘La Source’, then further to the left is “Mysteries” – perfect for beginner to intermediate surfers. Then looking down the beach to the left and a 2 minute stroll away is another famous Moroccan line-up, “Anchor Point”. Morocco receives the same swells as the Atlantic coasts of Europe, but because of its more southerly location, does not suffer from the same cold winter weather. With swells ranging from 3 to 15 feet you will always find a wave to suit your level of surfing experience and ability. Those with less experience should not worry; when the points are 15 feet and grinding there’s always a sheltered spot to found. 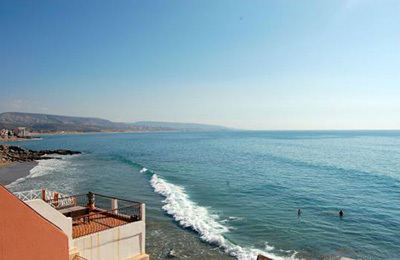 In Summer, when Taghazout surf spots are too small, there are always some waves in nearby Tamri, Imsoune or Tifnit. SURF SCHOOL & GUIDING Learn to Surf with fully qualified surf instructors, life guards with a surf coaching degree. They will take you to the best surf spots suitable for each individual’s skills. Discover this surfing Mecca with highly experienced guides who will take you to the best spots in the area according to swell conditions and your surfing skills, whether an intermediate or advanced surfer. Morocco lies directly across the Strait of Gibraltar, no more than 8 miles (13 km.) from Spain and Europe. Morocco is the only African country with coastal exposure to both the Atlantic Oceanand the Mediterranean sea, although most of its 1,150 miles (1.835 km.) of coastline are on the Atlantic shore. With so much Atlantic coastline, Morocco offers the surfer a dazzling array of opportunities. Rocky bottoms alternate with sandy ones, reef breaks with beach breaks, offering a surfing alternative for all conditions, skills and levels. Surfers will find string of first class surf spots down the whole Atlantic coast, from Tangier to Agadir and beyond in the deep south. The most famous surf spots lie just north of Agadir, around the fishing village and surfer hideaway of Taghazout. Although Americans and Australians were the surfers who brought the sport to Morocco in the 1970’s, now it is the European surfer along with his Moroccan counterpart who is indulging his passion for the wave. In the last few years, the popularity of this sport has grown rapidly on the international and Moroccan stage. Several organisations have been formed to encourage and to promote this sport. These groups have organised tournaments and contests, created surfing schools, formed ties with Europeans organisations and tried to make the country aware of the public relations and financial potentials of the sport. Agadir/Taghazout A few kilometres north of Agadir and easily accessible by bus or taxi, lies the atmospheric fishing village and surfing Mecca of Taghazout. 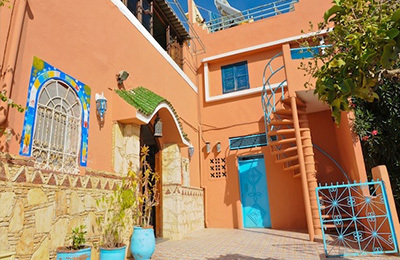 Even if there is always a handful of tourists around and Taghazout has become a hippy and surfer hideaway, the village still lives according to its own agenda. Yet much of the activities are related to tourism these days and there are many restaurants around playing Bob Marley all day long ! The locals still wear traditional clothes, wooden fishing boats lie on the shore, painted with colourful patterns and fishermen mend their nets on the beach. The village displays an array of narrow streets line by cubic white houses with doors of many colours and intricate patterns. Agadir is sited on a gentle bay with a seven miles of magnificent sandy beaches. It is the country’s leading fishing harbour and a lively ancient town founded by the Roman and watched over by its citadel, built by the Portuguese in 1540. But in 1960, shortly after the independence of the country, disaster struck and the city was virtually destroyed by two earthquakes and a tidal wave. In the aftermath of the disaster, the government undertook the reconstruction of Agadir and planed the area as Morocco’s major tourist resort. The city was rebuilt according to modern specifications for this purpose and today, Agadir is indeed Morocco’s foremost seaside resort and offers a wide range of five and four star hotels. Climate Mediterranean climate with Atlantic influence, with mild winters and hot summers. Because the coast is sheltered by Cap Ghir and surrounding hills, sunshine is virtually guaranteed in the Agadir region, with over 300 days of sunshine per year! The winter air temperature seldom drops below 22C during the day, and the water temperature averages 18C. The transportation is done by tourist transport, which means that the vehicle is licensed and insured for tourism, and affords the maximum luxury available, with the goal of the highest international standard of comfort and security. And more cities that fly direct to Morocco. You can also go to Agadir or Marrakech with connection through London. Some of the cities that fly to London with Ryan Air are: Biarritz, Basel, Berlin, Frankfurt, Hamburg, Grenoble, Marseille, Oslo, Faro, Santander, Porto, Newquay, Seville, Tenerife and many many more. TWO BEDROOM APARTMENTS 120 EUR per night. "Blown away by the location of this place and the incredible view over Killers point. We arrived and I was pleasantly surprised to find our apartment to a which was an great size including 3 balconies. The staff were also friendly and accommodating. The only downside is it's not immediately close to Taghazout but only approx a 15 20 minute walk away along the coast. Definitely recommend staying here." "I stayed as part of a yoga retreat. The location is stunning with beautiful views over killers bay. The apartments were well furnished and the bathroom was great. All equipment provided in the kitchen including fridge. It's a 20 min walk into Tagazhout where there are shops and cafes. I would definitely recommend this property." "Very good location, surfwise, just in front of Killer point Apartment. Spacious rooms and very welcoming staff, with private parking lot and a wonderful pool facing the ocean. Great for families or couples, a must!"